Catalytic Converter Replacement Cost Guide - NEW! How Much Does it Cost to Replace a Catalytic Converter? One of the most common emails I get from readers is about catalytic converter replacement costs. Having to pay an arm and a leg for car repairs is never fun. It’s even worse when the problems are caused by parts that have little to no effect on your car’s performance. 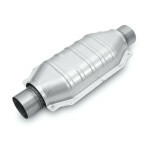 The catalytic converter is part of your vehicles exhaust system that’s designed to reduce emissions. It sits along the exhaust pipe between the engine and the muffler – usually under the front seats of your car. Why are these parts so expensive? Because they have a web of precious metals built inside. When your exhaust fumes contact these special metal surfaces, they turn into harmless gases like carbon dioxide and water. Unfortunately, these special metals like platinum, palladium, rhodium, and gold are very valuable and costly. 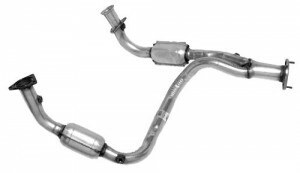 The good news is that there are a few inexpensive catalytic converter replacement options you can purchase online. Editor’s Note: Not sure which replacement part is right for your car or truck? Follow links below to check vehicle fit on Amazon. 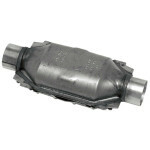 This cheap catalytic converter will fit any application that can accommodate the 2 inch inlet and outlet simple pipe connection. The stainless steel body weighs less than 5 pounds with an overall length of 13.25 inches covered in an aluminized heat shield. It can also be installed in both directions as long as the heat shield is facing upward. Customers should not expect a similar polished finish as with other exhaust upgrades. 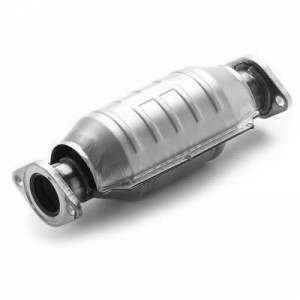 Replacement Catalytic converters are not meant to be aesthetically pleasing, but rather to fulfill its propose in meeting the strict regulations. This product is non-CARB (California Air Resources Board) compliant meaning it is not legal for use in the state of California. According to the manufacturer’s website, they provide a limited lifetime warranty on qualifying product lines. The catalytic converters however, do not fall in this category. 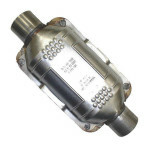 If you are in need of a cheap catalytic converter replacement, the 15036 is reasonably priced. That is a fraction of what original equipment would cost. 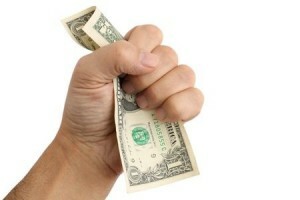 Expect to pay double or even triple that amount buying straight from the original manufacturer. Direct fit means simple bolt-on installation with no fuss. The connections are flanged and not just open piping as you may see in most universal application. The body weighs 5 pounds and is constructed from stainless steel with a heat shield for protection. It is typical for catalytic converters to have some form of thermal protection due to the enormous amount of heat generated during the catalyst reaction. The body shape and shield also makes the component distinguishable among other exhaust components. Magnaflow stands by this product with a warranty of 25000 miles or 5 years depending on whichever comes first. 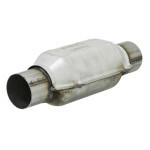 If you drive a truck or an SUV you most likely have two catalytic converters within your exhaust system. That means it will cost you twice as much to replace them. 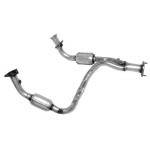 One of the most popular replacement Y pipes is the Walker Ultra EPA Catalytic Converter. It comes shipped as one solid piece including exhaust pipes and flanges. You can take pride in the fact that it’s constructed with 16 gauge stainless steel pipes. Even though this is an inexpensive replacement part, it still looks great once it’s installed. Since the pipes are coated with a 409 stainless steel shell it will give you that lasting shine and hold up well against dirt and grime. If you’ve had emissions problems in the past, you’ll be relieved to know that the Walker Ultra Series is designed with additional precious metals to reduce harmful exhaust gases.